The aim of this work was to study the apelin level in hemodialysis (HD) patients and assess its association with cardiac parameters among these patients. Mortality in end-stage renal disease (ESRD) patients on maintenance HD is higher by several folds compared with that in the general population, and up to 50% of deaths in these patients are caused by cardiovascular diseases. Apelin, which is a recently discovered active peptide, has a broad range of physiological and pathological actions. A total of 80 nondiabetic end-stage renal failure patients on regular HD, in addition to 20 apparently healthy individuals as the control group, were studied. Lipid profile, serum apelin level, and echocardiography were measured in all patients. Serum apelin is highly significantly lower in ESRD patients on maintenance HD compared with that in the control group (P ≤ 0.001). Serum apelin was significantly positively correlated with left ventricular end-systolic dimension (r = 0.290, P = 0.038), left ventricular end-diastolic dimension (r = 0.30, P = 0.021), interventricular septum (r = 0.295, P = 0.036), right ventricle (r = 0.271, P = 0.042), left atrium (r = 0.357, P = 0.014), and aorta (r = 0.339, P = 0.023) in ESRD patients. The apelin level was highly significantly lower in HD patients and it was significantly positively correlated with echocardiographic parameters. Thus it might be involved in the pathophysiology of cardiovascular disease in ESRD. Patients with end-stage renal disease (ESRD) have greater mortality compared with the general population, and cardiovascular disease (CVD), which is the main cause of death in these patients, accounts for 40–60% of mortality. The pathophysiology of CVD in maintenance hemodialysis (HD) is multifactorial and includes both traditional risk factors such as hypertension and diabetes and nontraditional risk factors such as anemia, oxidative stress, inflammation, hyperparathyroidism, and vascular endothelial dysfunction ,,,. There may be many other factors involved in the pathogenesis of CVD, among them being the recently discovered apelin–angiotensin receptor-like 1 (APJ) pathway ,. Apelin is a recently discovered bioactive peptide and together with its associated receptors (APJ) is widely distributed in various tissues such as the central nervous system, kidneys, heart, lungs, and adipose tissue ,,,. In addition, APJ receptors are detected in the endothelial cells of many vessels, including renal, coronary, pulmonary and bronchial vessels, endocardial cells, and vascular smooth muscle cells ,. Many studies indicate the role of apelin in cardiovascular functions and fluid balance, such as positive inotropic effects, vasodilation, decreased blood pressure, and inhibition of antidiuretic hormone release ,,,. Because of the role of serum apelin in physiological cardiovascular regulation and endothelial functions, it may have a role in CVD in patients with ESRD with increased burden of mortality. Thus, the aim of this study was to determine the apelin level in HD patients and assess its association with echocardiographic parameters among those patients. This study was carried out at the Dialysis Unit of the Department of Internal Medicine, Menoufia University Hospitals, on 80 nondiabetic patients with ESRD on maintenance HD (38 men and 42 women). All patients were undergoing regular hemodialysis for 3–4 h a day three times a week. Blood flow was usually 180–280 ml/min with a dialysate flow of 500 ml/min. All patients were dialyzed using low-flux dialyzers with bicarbonate-buffered dialysate. In addition, 20 apparently healthy volunteers were included as controls (11 men and nine women). All participants underwent full history taking, and clinical examination was performed with special emphasis on the cardiovascular system. Blood pressure measurements were taken with a sphygmomanometer and calculated as the average of three measurements taken at different occasions in the sitting position: mean arterial pressure = diastolic pressure + 1/3(systolic pressure − diastolic pressure) (normally 70–110 mmHg). BMI was calculated as weight in kilograms divided by the square of height in meters (kg/m 2). Patients falling under the following criteria were excluded: those with diabetes mellitus, congenital heart disease, ischemic heart disease, atrial fibrillation, ischemic heart disease, atrial fibrillation, and pacemaker implantation, patients with decompensated heart failure, those with decompensated liver cirrhosis or chronic obstructive airway disease, and cancer patients. The protocol for this study followed ethical standards and was approved by the ethical committee of our institution. All participants gave informed consent to participate in this study. Blood samples for hematological and biochemical measurements were obtained after overnight fasting. 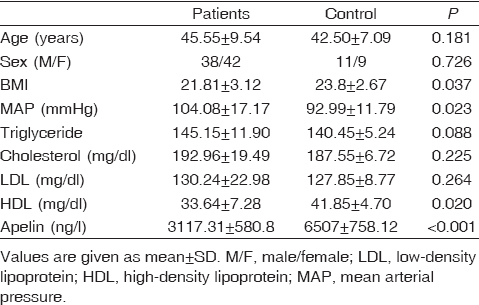 Serum creatinine, albumin, calcium, phosphorus, and lipid profile including serum cholesterol, triglycerides, high-density lipoprotein, and low-density lipoprotein were evaluated using standard methods in the routine clinical laboratory. Apelin was measured by means of competitive enzyme immunoassay (Phoenix Pharmaceuticals Inc., Burlingame, CA, USA). Plasma peptide levels were expressed as ng/l . Transthoracic echocardiography was performed in all patients and controls using Medison (model-Sonoace X6, Power 100–120/200–240 V, 0.8/5 A, 50/60 Hz transducer with 2.5-5 phased array transducer; Medison Co. Ltd). The following parameters were assessed: left ventricular end-diastolic dimension (LVEDD); left ventricular end-systolic dimension (LVESD); left ventricular posterior wall (LVPW); interventricular septum (IVS); left atrium (LA); aorta (AO); right ventricular diameter (RVD); and ejection fraction (EF). Data were analyzed using the statistical package for the social science (SPSS, version 20.0, IBM, USA). Quantitative data were expressed as mean ± SD. Qualitative data were expressed as frequency and percentage. The following statistical tests were used as appropriate: the c2-test and Student's t-test. Correlations between variables were ascertained using Spearman's rank correlation coefficient (r). Values of P valueless than 0.05 were taken as statistically significant. Eighty patients were included in the study. The mean age of the patients was 45.55 ± 9.54 years and the female/male ratio was 38/42. Demographic, clinical, and laboratory data are presented in [Table 1]. The causes of renal failure among the HD patients varied as follows: hypertensive nephrosclerosis in 41 (51.3%) patients, chronic glomerulonephritis in 14 (17.5%) patients, adult dominant polycystic kidney disease in eight (10%) patients, obstructive uropathy in 11 (13.8%) patients, or unknown etiology in six (7.5%) patients. The duration of dialysis among the renal failure patients ranged from 0.5 to 22 years, with a mean of 5.4 ± 4.9 years. The vascular accesses among HD patients were arteriovenous fistula (n = 56), temporary internal jugular vein catheter (n = 16), and arteriovenous graft (n = 8). Mean plasma apelin (ng/l) was highly statistically significantly lower in HD patients than in controls (3117.31 ± 580.8 vs. 6507 ± 758.12, P < 0.001). There was no difference in the levels between men and women (P > 0.05). Echocardiographic findings are presented in [Table 2]. We observed that our HD patients included in the study had significantly lower EF and significantly higher LVESD, LVEDD, LVPW thickness, IVS thickness, and LA dimension compared with controls (P < 0.05). There was no significant difference between the two groups with respect to RVD and AO dimension (P > 0.05). 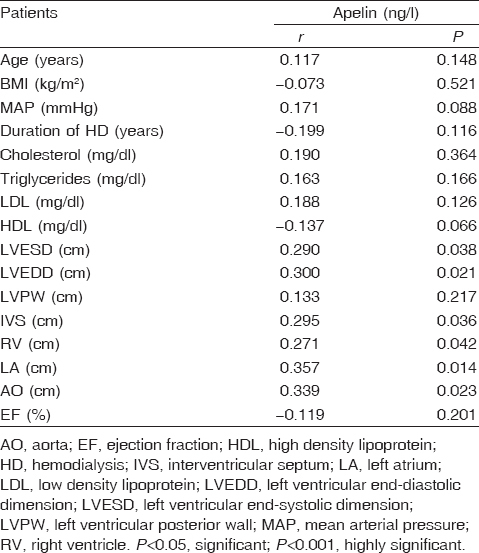 In HD patients, apelin does not correlate with age, BMI, duration of dialysis, mean arterial pressure, lipid profiles, LVPW, or EF. However, apelin significantly correlates with LVESD, LVEDD, IVS thickness, RVD, LA dimension, and AO dimension. These data are shown in [Table 3] and [Figure 1]. Figure 1: Correlation between apelin and left ventricular end-systolic dimension. (LVESD), left ventricular end-diastolic dimension. (LVEDD), interventricular septum. (IVS), right ventricular. (RV), left atrium. (LA), and aorta. (AO). The most common complication and the leading cause of mortality in patients with ESRD is CVD. The mortality in patients on maintenance HD due to CVD is up to 30-fold greater than that in the general population. It is estimated that 80% of ESRD patients on regular HD have cardiovascular complications . The role of the apelin/APJ pathway in the regulation of the cardiovascular system was documented by the observation that encoding of both receptor and ligand mRNA is widely distributed in human and rat tissues, including the heart and vasculature . There is evidence that the apelin/APJ pathway contributes to the pathogenesis of CVD. Some studies have revealed changes in plasma apelin levels in patients with heart failure. Chen et al. found that plasma apelin increased in early stages of heart failure, but its level became neutral or decreased in later stages ,,. In our study, plasma levels of apelin in HD patients were significantly lower than those in the healthy control group. Similar results of lower levels of plasma apelin in HD patients were also documented by Malyszko et al. , El-Wakil et al. , and El-Shehaby et al. . Codognotto et al. and Aoki et al. also found that plasma apelin levels are lower in HD patients when compared with those with normal glomerular filtration rate, and those lower levels were not related to heart involvement but were due to the uremic environment. In contrast to our result, Zhang et al. and Büyükbakkal et al. found that apelin levels were higher in HD and peritoneal patients than in healthy individuals. However, Malyszko et al. , Mafra et al. , and Leal et al. did not observe any difference between apelin levels in dialysis patients and those in healthy individuals. There are a number of explanations for these low levels of apelin. Apelin levels may be decreased because of increased metabolism or reduced production/release or enhanced loss from tissues in HD patients. Also, there are conflicting results on the role of dialysis on apelin levels. El-Shehaby et al. and Goetze et al. showed that there is no significant difference between predialysis and postdialysis sessions. In contrast, Zhang et al. found that serum apelin level was significantly decreased after a HD session. As apelin is predominantly produced by the vascular endothelium, especially the cardiac and pulmonary vascular endothelium ,, its level may be reduced with respect to the uremic environment and progressive loss of renal vasculature. The last point might be supported by the observations of El-Shehaby et al. , who found that apelin levels significantly increased after successful kidney transplantation, although it was still significantly lower than normal levels. Patients with ESRD are considered a high-risk population with multiple traditional and nontraditional risk factors for CVD. The pathophysiology of CVD in ESRD patients is multifactorial and includes coronary artery disease, arteriosclerosis, cardiomyopathy [left ventricular hypertrophy (LVH) and/or dilatation], and a potential risk for arrhythmogenic sudden cardiac death . In the present study, we found that HD patients have statistically significantly lower EF and higher LVESD, LVEDD, LVPW thickness, IVS thickness, and LA dimensions compared with controls. This was in agreement with the findings of El-Wakil et al. 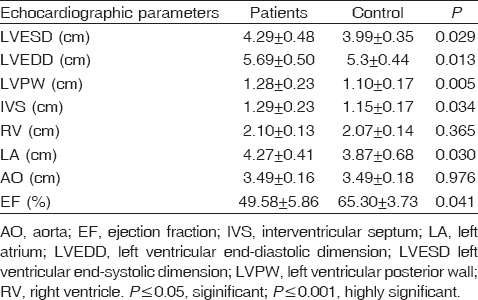 and El-Shehaby et al. . Left ventricular dysfunction and left LVH are common features in patients with ESRD compared with the general population. EF below 35% is seen in approximately one in seven patients with ESRD and LVH is present in up to 80% . The presence of arterial hypertension, anemia, hypervolemia, and an arteriovenous fistula promotes the development of left ventricular dilation and hypertrophy. LVH is a component of uremic cardiomyopathy and is a major risk factor for sudden cardiac death, heart failure, and cardiac arrhythmias in dialysis patients . Moreover, plasma apelin was found to be positively correlated with VESD, LVEDD, IVS thickness, RVD, LA dimension, and AO dimension in ESRD patients. Malyszko et al. and El-Shehaby et al. also showed that plasma apelin level positively correlated with LVESD, LVEDD, IVS, RV, LA, and the AO, which are all indirect markers for volume status in HD patients. The physiological actions of apelin on the cardiovascular system – namely, vasodilatation, positive inotropism, decreased blood pressure, and diuresis resulting from inhibition of antidiuretic hormone release – appear to antagonize the deleterious actions of the renin–angiotensin–aldosteron system . It may be hypothesized that fluid overload and hypertension are common in dialysis patients, and thus apelin levels are upregulated to maintain compensatory diuresis, increased cardiac contractility, and vasodilatation. However, this needs to be validated through further studies. As apelin has a positive inotrope in normal and failing hearts it may be used in the future as a therapeutic tool in both the uremic and the nonuremic population. The apelin level was significantly lower in HD patients and it significantly positively correlated with echocardiographic parameters. Thus it might be involved in the pathophysiology of CVD in ESRD. Prospective studies with large populations are required. Sarnak MJ, Levey AS. Cardiovascular disease and chronic renal disease. A new paradigm. Am J Kidney Dis 2000; 35 (Suppl 1):117–131. Miller LM, Sood MM, Sood AR, Reslerova M, Komenda P, Rigatto C, Bueti J. Cardiovascular disease in end-stage renal disease: the challenge of assessing and managing cardiac disease in dialysis patients. Int Urol Nephrol 2010; 42:1007–1014. Hou FF, Jiang JP. China collaborative study on dialysis: a multi-centers cohort study on cardiovascular diseases in patients on maintenance dialysis. BMC Nephrol 2012; 13:94. Kahn MR, Robbins MJ, Kim MC, Fuster V. Management of cardiovascular disease in patients with kidney disease. Nat Rev Cardiol 2013; 10:261–273. Tatemoto K, Hosoya M, Habata Y, FujiiR, Kakegawa T, Zou MX, et al. Isolation and characterization of a novel endogenous peptide ligand for the human APJ receptor. Biochem Biophys Res Commun 1998; 251:471–476. Malyszko J, Malyszko JS, Pawlak K, Wolczynski S, Mysliwiec M. Apelin, a novel adipocytokine, in relation to endothelial function and inflammation in kidney allograft recipients. Transplant Proc 2008; 40:3466–3469. Falcao-Pires I, Leite-Moreira AF. Apelin: a novel neurohumoral modulator of the cardiovascular system: pathophysiologic importance and potential use as a therapeutic target. Rev Port Cardiol 2005; 24:1263–1276. Chandrasekaran B, Dar O, McDonagh T. The role of apelin in cardiovascular function and heart failure. Eur J Heart Fail 2008; 10:725–732. Goetze JP, Rehfeld JF, Carlsen J, Videbaek R, Andersen CB, Boesgaard S, Friis-Hansen L. Apelin: a new plasma marker of cardiopulmonary disease. Regul Pept 2006; 133:134–138. Boucher J, Masri B, Daviaud D, Gesta S, Guigné C, Mazzucotelli A, et al. Apelin, a newly identified adipokine up-regulated by insulin and obesity. Endocrinology 2005; 146:1764–1771. Kleinz MJ, Skepper JN, Davenport AP. Immunocytochemical localization of the apelin receptor, APJ, to human cardiomyocytes, vascular smooth muscle and endothelial cells. Regul Pept 2005; 126:233–240. Charles CJ. Putative role for apelin in pressure/volume homeostasis and cardiovascular disease Cardiovasc Hematol Agents Med Chem 2007; 5:1–10. Tatemoto K, Takayama K, Zou MX, Kumaki I, Zhang W, Kumano K, Fujiyama M. The novel peptide apelin lowers blood pressure via a nitric oxide-dependent mechanism. Regul Pept 2001; 99:87–92. Karadag S, Ozturk S, Gursu M, Gurdal A, Basinoglu F, Yigit S, et al. 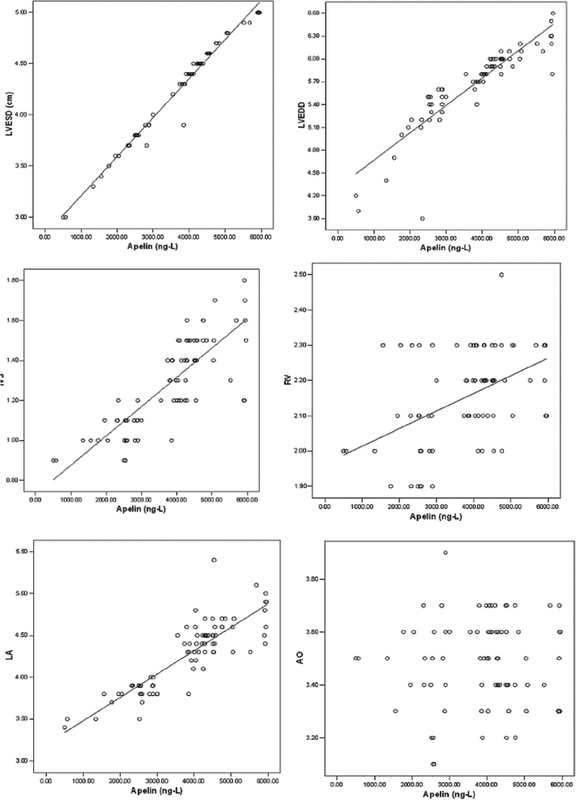 The relationship between apelin and cardiac parameters in patients on peritoneal dialysis: is there a new cardiac marker? BMC Nephrol 2014; 15:18. Kleinz MJ, Davenport AP. Emerging roles of apelin in biology and medicine. Pharmacol Ther 2005; 107:198–211. Heinonen MV, Purhonen AK, Mitettinen P, Paakkonen M, Pirinen E, Alhava E, et al. Apelin, orexin A and leptin plasma levels in morbid obesity and effect of gastric banding. Regul Pept 2005; 130:7–13. Katugampola SD, Maguire JJ, Matthewson SR, Davenport AP. [(125) I]-(Pyr (1)) Apelin-13 is a novel radioligand for localizing the APJ orphanreceptor in human and rat tissues with evidencefor a vasoconstrictor role in man. Br J Pharmacol 2001; 132:1255–1260. Chen MM, Ashley EA, Deng DXF, Tsalenko A, Deng A, Tabibiazar R, et al. Novel role for the potent endogenous inotrope apelin in human cardiac dysfunction. Circulation 2003; 108:1432–1439. Chong KS, Gardner RS, Morton JJ, Ashley EA, McDonagh TA. Plasma concentrations of the novel peptide apelin are decreased in patients with chronic heart failure. Eur J Heart Fail 2006; 8:355–360. Miettinen KH, Magga J, Vuolteenaho O, Vanninen EJ, Punnonen KR, Ylitalo K, et al. Utility of plasma apelin and other indices of cardiac dysfunction in the clinical assessment of patients with dilated cardiomyopathy. Regul Pept 2007; 140:178–184. Malyszko J, Malyszko JS, Kozminski P, Mysliwiec M. Apelin and cardiac function in hemodialyzed patients: possible relations? Am J Nephrol. 2006; 26:121–126. El-Wakil H, Abdel-Gawad H, Aboulenein F, Shaath EA, Abdel-Aziz HK. Cardiovascular risks in hemodialyzed patients: could apelin have a role? Bull Alex Fac Med 2007; 43:919–923. El-Shehaby AM, El-Kathib MM, Battah AA, Roshdy AR. Apelin: a potential link between inflammation and cardiovascular disease in end stage renal disease patients. Scand J Clin Lab Invest 2010; 70:421–427. Codognotto M, Piccoli A, Zaninotto M, Mion M, Vertolli U, Tona F, Boffa GM. Evidence for decreased circulating apelin beyond heart involvement in uremic cardiomyopathy. Am J Nephrol 2007; 27:1–6. Aoki J, Ikari Y, Nakajima H, Mori M, Sugimoto T, Hatori M, et al. Clinical and pathological characteristics of dilated cardiomyopathy in haemodialysis patients. Kidney Int 2005; 67:333–340. Zhang DL, Liao H, Wei YY, Zhang QD Wang ZG. Elevation of serum apelin-13 is positively correlated with ADMA in patients on maintenance hemodialysis. Clin Nephrol 2009; 71:405–412. Büyükbakkal M, Canbakan B, Eser B, Yayar Ö, Ercan Z, Merhametsiz Ö, et al. The relation between apelin levels, echocardiographic findings and carotid intima media thickness inperitoneal dialysis patients. Ren Fail 2015; 37:433–438. Malyszko J, Malyszko JS, Mysliwiec M. Visfatin and endothelial function in dialyzed patients. Nephrology 2010; 15:190–196. Mafra D, Lobo JC, Farage NE, Stockler-Pinto MB, Leal VO, Calixto A, Geloneze B. The relationship between apelin and parathyroid hormone in hemodialysis patients. Ren Fail 2012; 34:970–973. Leal VO, Lobo JC, Stockler-Pinto MB, Farage NE, Calixto A, Geloneze B, Mafra D. Apelin: a peptide involved in cardiovascular risk in hemodialysis patients? Ren Fail 2012; 34:577–581. O' Shea M, Hansen MJ, Tatemoto K, Morris MJ. Inhibitory effect of apelin-12 on nocturnal food intake in the rat. Nutr Neurosci 2003; 6:163–167. Foley RN, Parfrey PS, Sarnak MJ. Clinical epidemiology of cardiovascular disease in chronic renal disease. Am J Kidney Dis 1998; 32:S112–S119. Passman R. Prevention of sudden cardiac death in dialysis patients: drugs, defibrillators or what else. Blood Purif 2013; 35:49–54. Malyszko J, Malyszko JS, Kominski P, Myliwiec M. Apelin, a novel adipocytokine, and cardiac function in hemodialyzed patients: possible relations? Am J Nephrol 2006; 26:121–126.